Mohammed Kadir and Mark Fowler. Three men, including one whose father is charged was recently charged with cocaine trafficking, were Tuesday charged with a similar offence after they were intercepted allegedly while engaging in a cocaine transaction. 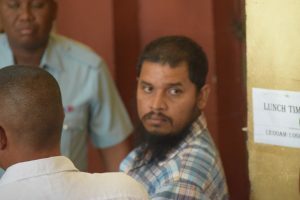 Thirty-seven year old Mohamed Kadir, 33-year old Ryan Gomes and Mark Fowler were arraigned by Chief Magistrate Ann Mc Lennan on a cocaine trafficking charge. After Fowler pleaded guilty, he was sentenced to four years imprisonment and fined GY$6.75 million. Kadir and Gomes denied the charge and they were remanded to prison until April 13. The Customs Anti-Narcotics Unit (CANU) alleges that on March 29, 2018 at Sheriff Street they trafficked 2.250 kilogrammes of cocaine. Ryan Gomes, son of cocaine-accused Andre “Zipper” Gomes. 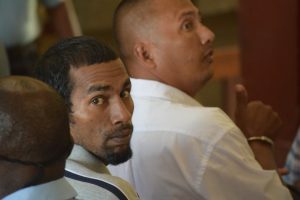 CANU Prosecutor Konyo Sandiford, representing the State, told the court that about 7:35 PM, CANU agents observed two motor vehicles. Kadir exited one vehicle with a yellow Shell gas cylinder and proceeded to the other car PMM 5807 which belongs to Gomes. Fowler was a passenger of Gomes’ car and hewas intercepted by the ranks of CANU. A field test was done on site since the gas bottle had what was suspected to be cocaine. The trio was then taken to CANU headquarters where the substance was tested and weighed in their presence. Gomes is the son of Andre “Zipper” Gomes of Craig Street, Campbellville who was arrested by CANU at his residence in January for allegedly being in possession of cocaine for the purpose of trafficking.